Fishing, commercial salmon; 033. [newspaper article afixed identifies fishermen and provides other background information]:  Left to right: Rollie Worthington; Isaac "Ike" Austin; Ed Erickson; Otto Larson and Willie Austin. Description 8 x 10 negative filed with photo. Scanned as B & W. 11/10/2013: Alice Austin Cook identifies the first man on the left as her father, Charles Austin, and not Rollie Worthington. 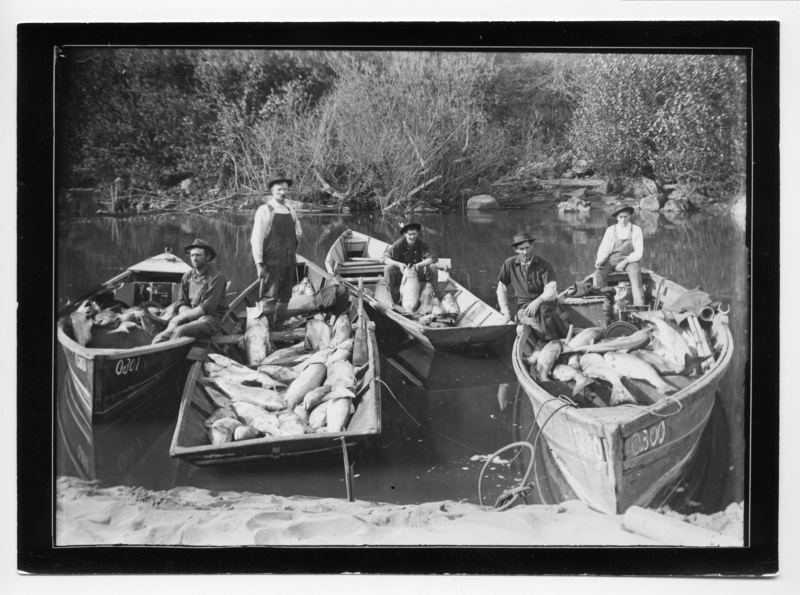 Transcription Fishing, commercial salmon; 033. [newspaper article afixed identifies fishermen and provides other background information]: Left to right: Rollie Worthington; Isaac "Ike" Austin; Ed Erickson; Otto Larson and Willie Austin.